Popular for its low cost and ease of acquisition, the .22 long rifle is perhaps the most famous cartridge in the world. 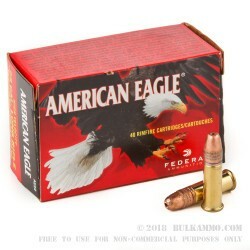 Although it isn't an effective hunting round, it's great for eliminating small varmints and even better for practice. .22 LR turns a 200-yard range into a 400-500 yard range, with the small and light bullet behaving similarly at shorter distances as larger and faster bullets at longer ones. 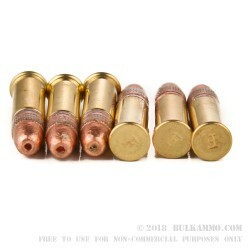 These 38 grain copper-plated hollow points are ideal for the former purpose, their expansion on impact making pest removal a breeze. Best for ridding your property of smaller varmints, these bullets are far less likely to ricochet or overshoot than their larger counterparts. Furthermore, their copper jacket allows for uniform expansion, promoting the chances of a humane kill on the first hit. 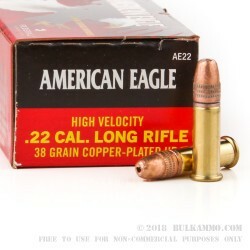 These .22 LR Rimfire cartridges come loaded with a 38 grain Copper Plated Hollow Point (CPHP) bullet. The cartridge produces 134 foot-pounds of energy at the muzzle, and travels at 1,260 feet per second out of the barrel. Its rimfire brass cartridge isn't readily reusable. 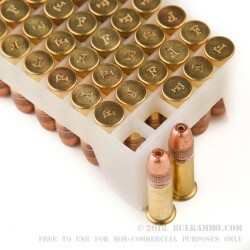 The rounds come packaged in plastic trays containing 40 cartridges, with cardstock boxes containing those trays. This case includes 10 boxes total.